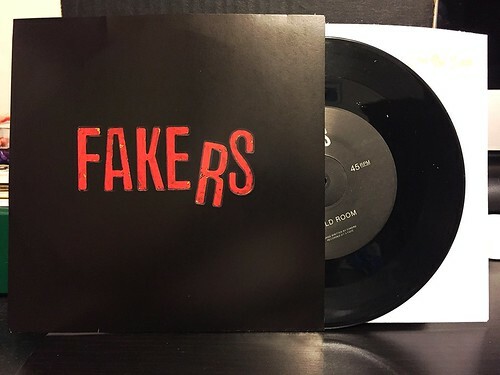 This 7" is the debut of Fakers, they ended up on my radar due to Travis from Piebald being in the band. While I'll never claim to be a Piebald super fan, I really do enjoy a few of their records quite a bit. To me, it seemed worth picking up this record. Honestly, I'm somewhat let down. It's not nearly as catchy and melodic as I figured it would be. Neither song is bad, but both kind of give off something of an LA bar band vibe. "Six Hundred Dollars" is aptly titled as the singer shouts that phrase quite a few times throughout the course of the song. Musically, it also sounds surprisingly thin especially considering that I'm pretty sure there are three guitar players and a bass. "Gold Room" is more up my alley. It's not as repetitious as "Six Hundred Dollars" and the singing is not as shouty as it is on the flip side. There's some gang vocals that come off a little cheesy, but in general it's an okay song. It reminds me a little bit of Napalmpom, though not nearly as glammy. I'm not going to write Fakers off after one 7". It may not be a super impressive, knock your socks off debut, but it's not bad. I'll probably give their next record a try, but this time I may need to listen to a few songs first.